Every business seeks improvement, whether that’s through bottom-line improvement or finding the best candidates to fill certain positions. Sometimes the two objectives go hand-in-hand, and actively seeking diverse candidates can help businesses improve both of these objectives. Diversifying your staff has been proven to lead to positive outcomes for multiple aspects of a business, but has your team ever thought about diversity in broader terms than a person’s race or gender? Recent trends have shown that businesses are beginning to embrace people with disabilities as a group to retain for a competitive advantage. 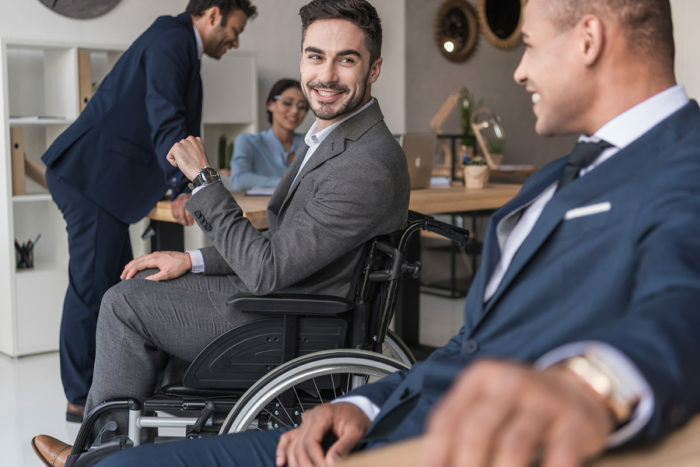 Disability inclusion allows businesses to receive additional financial incentives and tax breaks, fulfill hiring goals set by federal contractors and improve productivity, overall morale and corporate culture. However, sometimes, a company’s hiring practices can unknowingly screen out people with disabilities. The company I work for, Tangram Business Resourcing, works with businesses helping them to recruit, employ and retain people with disabilities. We’ve found that changing some hiring practices can help businesses better recruit and retain a talent pool that includes people with disabilities. All businesses start with recruiting talent. HR professionals want to find the best candidates for their open positions, and recruiting practices dictate the types and quality of candidates that are ultimately attracted to these positions. Recruitment practices vary depending on the type of company, but common ways to recruit include industry-specific mailing lists, job fairs, hiring from within and advertisements. These options all work, but there is always room to improve your practices in order to achieve a more diverse staff. Advertising — Job seekers with disabilities utilize many of the same resources as job seekers without disabilities, such as online job boards, college career services, industry-specific outlets and newsletters. Businesses don’t always consider the option of using disability service providers and schools as venues to promote open positions. This allows recruiters to cast a wider net — a net that is usually free of charge. There are also online job boards such as this one by the American Association of People with Disabilities that are targeted to people with disabilities. These types of partnerships reach a large number of job seekers with disabilities that recruiters originally might not have had access to. Job fairs — Job fairs are a great way for companies to find a large number of job seekers all at one time. They’re also very common and often will target specific demographics, like veterans or college students. Businesses will find some degree of success when attending these job fairs, but they are limiting themselves if they don’t seek recruiting opportunities that target people with disabilities. Community and educational partners can alert your recruitment team to job fairs reaching this demographic, including job fairs hosted by community colleges, vocational rehabilitation organizations and government-sponsored agencies and other disability service groups, or through transition fairs at high schools. Make connections — Learn more about the disability community and engage with organizations that are committed to helping jobseekers with disabilities find meaningful work. By building relationships with these groups, companies will be more aware of qualified candidates with disabilities that are looking for employment. When working or partnering with schools, connect with both their career and disability services. Training — Many recruiters have an initial idea of the kind of person they think will best fill a certain position. However, if these recruiters don’t have experience working with people with disabilities, fear and preconceived notions about people with disabilities may be unintentionally coloring their recruitment practices. This unconscious bias can lead them to avoid people with disabilities, even when they may have all the skills and background required to do the job. Cornell University has an online toolkit for managers focused on helping them build a disability inclusive workforce. And the U.S. Chamber of Commerce has a “best practices” workbook, which includes a disability inclusion assessment test to help employers critique and enhance their disability practices. Companies can access a larger pool of qualified job seekers with disabilities if they actively work on establishing new recruitment practices that target this segment of the population.